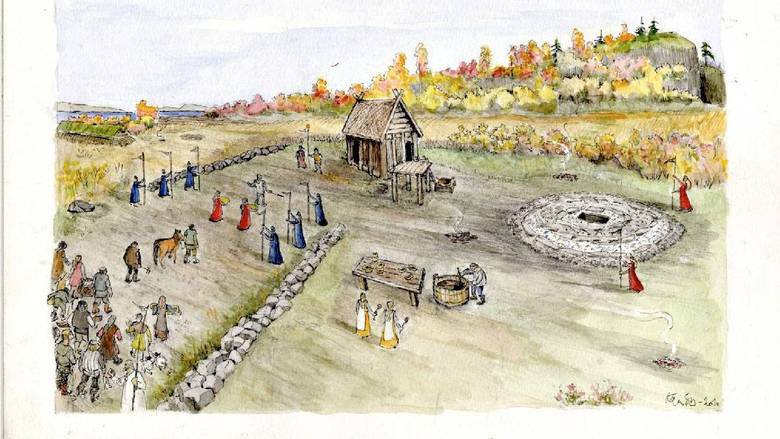 Excavations for house foundations at Ranheim, Norway, have uncovered a small “gudehovet” or “god temple,” a structure used by pre-Christian Pagan peoples. Used from around the eighth or ninth centuries BCE until the 10th century AD/CE, the site is well preserved because it was covered over by its worshippers with a thick layer of peat, apparently in order to protect it from marauding Christians. It is surmised that the site’s inhabitants fled Christian invaders, who were known to slaughter the natives and destroy their sacred sites. 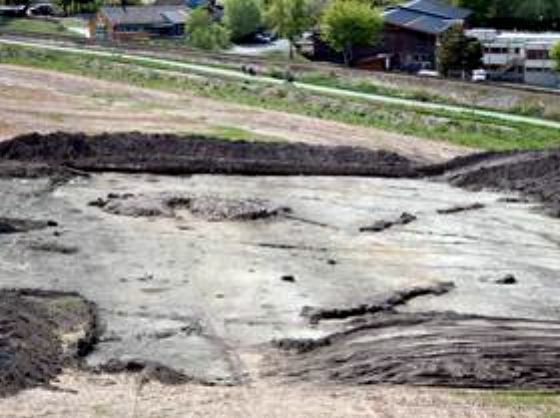 The covering over of the site coincides with an exodus recorded in ancient Norse sources, around the time of the first Norwegian king, Harald Fairhair (872-930). These Norse writings were later composed in Iceland, relating that some 40 people had come there from the area of Trøndelag, Norway. A fascinating discovery is shedding light upon pre-Christian Scandinavian religion and early Christian inroads into Norway. In the Norwegian press, this highly important find is being called “unparalleled,” “first of its kind” and “unique,” said to have been “deliberately and carefully hidden” – from invading and destructive Christians.Located at the site of Ranheim, about 10 kilometers north of the Norwegian city of Trondheim, the astonishing discovery was unearthed while excavating foundations for new houses and includes a “gudehovet” or “god temple.” Occupied from the 6th or 5th century BCE until the 10th century AD/CE, the site shows signs of usage for animal sacrifice, a common practice among different peoples in antiquity, including the biblical Israelites. (E.g., Num 7:17-88) Over 1,000 years ago, the site was dismantled and covered by a thick layer of peat, evidently to protect it from marauding Christian invaders. These native Norse religionists apparently then fled to other places, such as Iceland, where they could re-erect their altars and re-establish the old religion. The pagan sanctuary survived because the last people who used it over 1,000 years ago did their utmost to hide the entire system with an unusually thick layer of soil…. “The discovery is unique in a Norwegian context, the first ever made ​​in our latitudes,” says Preben Rønne of the Science Museum/University of Trondheim, who led the excavations. The god temple may have been built sometime around or after the year 400 AD, thus used for hundreds of years until the people emigrated to avoid Christianity’s “straitjacket.” It consisted of a stone-set “sacrificial altar” and also traces of a “pole building” that probably housed idols in the form of sticks with carved faces of Thor, Odin, Frey and Freya. Deceased relatives of high rank were also portrayed in this way and attended. Nearby, the archaeologists also uncovered a procession route. Thanks to the soil, the god temple was very well preserved. The “altar” where one worshiped the gods and offered animal blood consisted of a circular stone setting around 15 meters in diameter and nearly a meter high. The pole building a few meters away was rectangular, with a floor plan of 5.3 x 4.5 meters, and raised with 12 poles, each having a solid stone foundation. The building may have been high and, from the findings, was very clearly not used as a dwelling. Among other reasons, it had no fireplace. Inside the “house” were found traces of four pillars that may be evidence of a high seat where the idols stood between ceremonies. The processional road west of the temple and headed straight towards the pole building was marked with two parallel rows of large stones, the longest sequence at least 25 feet long. When archaeologists began excavation work last year, the site was thought at first to be a flat burial mound with a “master’s grave” and one or more secondary graves. “But as we dug, the mound appeared more and more strange,” says Rønne. The latest dating of the god temple is between 895 and 990 AD. Precisely during this period Christianity was introduced by heavy-handed methods into Norway. This meant that many left the country to retain their original god-belief. Large pre-Christian cult sites in Scandinavia – often large settlements with a large central hall, frequently with a smaller attached building – have been found not in Norway, but, rather, in Central and Southern Sweden (Skåne), also in eastern Denmark. “In the sacrificial altar, we found a fire pit that actually lay directly on the prehistoric plow layer. The charcoal from this grave is now dated to 500-400 BC. Thus, the place could have been regarded as sacred or at least had a special status long before the stone altar was built. In the prehistoric plow layer under the fire pit, we could clearly see the traces of plowing with an ‘ard,’ a plow precursor,” said Rønne. The gods were Odin, Thor, Frey, often depicted as carved faces on wooden columns that could be moved, worshiped and sacrificed to. Ancestors were also depicted and worshiped. No such idols are recorded in Norway because they were all destroyed by the introduction of Christianity. It seems a criminal act to allow this astonishing and precious site to be destroyed as well! Hopefully, the Norwegian government will intervene to preserve this obvious World Heritage Site. In the Aftenposten article, this significant discovery at Ranheim is hailed as a “pre-Christian place of worship,” despite the fact that the stone temple there has been dated to the fifth century AD/CE. Over the centuries, it has been argued fallaciously and erroneously that, simply because something post-dates the “Christian” or common era – i.e., comes after the year 1 AD/CE – it is therefore automatically “post-Christian.” This erroneous perception is raised in comparative-religion studies in particular to suggest any possible borrowing to have been from Christianity to Paganism, rather than the other way around. Such a contention is false, as, in the first place, the dating system of BC/AD was first devised in the sixth century by the Christian monk Dionysius Exiguus (c. 470-544), based on Christian beliefs, not on any discernible scientific facts. We are therefore working with backdated markers designed to make an artificial timeline supposedly created by the Lord God himself, when he miraculously took birth through the womb of a Jewish virgin girl. In reality, no one in antiquity at the time was aware of this new timeline suddenly appearing with the birth of the Lord of the cosmos. The Romans went right along using their Julian calendar, while the Egyptians had their Alexandrian calendar, as if nothing had happened. Indeed, they were completely unaware that anything had happened. Secondly, the “Christian” era does not begin in the year 1 AD/CE, since, in reality, Christianity barely shows up in the historical record until the second century. A close inspection of the historical record reveals that, other than various parts of some Pauline epistles perhaps, there exists no credible, scientific evidence for anyone having ever heard of a “Jesus the Christ” before the end of the first century or early second. In addition, the earliest references seem to be to a “Chrestos,” not a “Christos.” In actuality, we possess no extant physical artifacts from the first century at all that are unambiguously Christian. Hence, the “Christian era” essentially did not even appear in the earliest places until the second century. For many centuries after its inception, Christianity remained unknown in countless places; hence, all those areas continued to be pre-Christian. For example, the European country of Lithuania held off Christian incursions until the 14th century, until which time, therefore, it was pre-Christian. Today, hundreds of people in remote tribes remain “uncontacted,” having never heard of Christianity; thus, they too constitute pre-Christian cultures, even though we are now more than 2,000 years past the magical BC/AD marker. This yardstick of the BC/AD timeline serving to prove whether or not a parallel motif within comparative religion could be deemed “pre-Christian” is therefore fallacious. In determining possible influences in either direction, from Paganism to Christianity or vice versa, we must thus ask specifically what is the scientific evidence of when Christianity could possibly have influenced a particular culture? To rely on the artificial BC/AD dividing line ranks as unscientific. In this Norwegian discovery, we evidently possess a genuinely pre-Christian site, a contention demonstrated by the fact that the site was covered over apparently to prevent its destruction by Christians. The fact that this important discovery is to be destroyed by a housing project also provides an example of why so much archaeological evidence of pre-Christian religion and mythology is no longer available to us. In the past, the destruction was often deliberate, frequently with Christian sites located on top of pre-Christian pagan places of worship, which is why this site was hidden, apparently, and why we can be certain that it ranks as pre-Christian. When the stone temple was built, the monk Dionysius had not yet determined the “Christian” era by devising his timeline. To many cultures, the pre-Christian/post-Christian timeline was not something in writing but depended on whether or not Christians had invaded their lands, slaughtered the people and destroyed their temples. It should be noted further that this site was evidently sacred for at least eight or nine hundred years before the stone temple was constructed. It is possible that the germ of Norse religion and mythology was practiced by the people who used this site in the first millennium BCE. For this reason, as well as the fact that many religious ideas date back thousands of years, the claim ranks as fallacious that, simply because a comparative-religion theme post-dates the “Christian” era, it was necessarily influenced by Christianity. If there are no overt Christian influences, it is often likely that the motif pre-dates the invasion of Christianity into the era and culture in question. In some of the cultures of the Roman Empire at the time, there evidently were other gods and sacrificial victims who were likewise portrayed as having been “side-wounded,” including the Norse Father-God Odin, who was hung on a tree and wounded with a spear…. 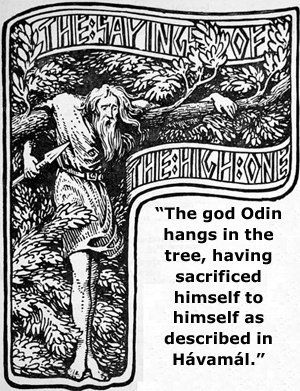 Furthermore, the “All-Father” god Odin’s invincible and beloved son, Balder, is pierced with a spear of mistletoe. Although Balder dies, in the time of the Ragnarok or Norse “apocalypse,” he will be reborn or resurrected. This latter motif is similar to Christ’s “Second Coming” depicted in Revelation. Although the Runatal poem was only written down in the 13th century AD/CE, parts of it are traceable to at least the 9th or 10th centuries, possibly before Christianity invaded the relevant Norse area and drove away the practitioners of the old religion. There is no clear indication of Christian influence on the Norse stories – other than the parallels – and the fact that the earliest extant accounts we possess with such details come from centuries after the so-called Christian era does not necessarily mean that these myths are post-Christian. In reality, there is little here that must have come from Christianity, as these various motifs represent nature-worship and astral mythology or astrotheology, and can be found abundantly in even older mythological systems. For example, in the Scandinavian myth we find the motif of “the Twelve,” with the “god of light” surrounded by “12 knights.” Immediately recognizable is not only the story of Christ and the 12 disciples but also King Arthur and the 12 knights of the Round Table. The configuration of a divine or legendary personage with 12 other figures, whether human or otherwise, represents a common formula that predates Christianity by eons. Numerous such configurations of “the Twelve” can be found throughout antiquity, including in the Bible. There is no reason at all to contend that this Norse motif was founded upon Christianity. On the contrary, there is every reason to suspect that the Christian 12 (+1) is based on the old formula, which in turn revolves significantly around the sun: the “light of the world” and “god of light,” surrounded by the signs of the zodiac, months of the year, hours of day and night, etc. The fact that there are 12 pillars or poles at this pre-Christian temple site indicates this popular 12 configuration. Architectural layouts with 12 divisions can be found in much older structures such as the Horus temple at Tharo, Egypt (c. 1,000 BCE). Hence, it would appear that the story of Balder the savior and the 12 subordinates, as well as the 12 names of Odin and the 12 gods of Asgard – possibly represented at Ranheim in the 12 pillars – emanate not from Christianity but from this millennia-old tradition. While the ancient Norse needed to cover up their sacred sites in order to protect them from Christian marauders, centuries later Christian apologists attempt to keep pre-Christian mythology buried, with all manner of fallacious arguments and calumny. Further such vandalism and suppression of the ancient Norwegian heritage should not be allowed, and this amazing temple site should be preserved.